Running backs Aaron Jones and Jamaal Williams were just a couple surprise players that sprung onto to the scene last year. Inexperience wasn’t a deterrent as each started multiple games and showed promise for Green Bay’s running game moving forward. Training camp is a little over a month away and the Packers would welcome any unlikely performers that can help the team get back to the playoffs in 2018. Here are three breakout players I believe will make a significant jump next season. McCray came out of nowhere and is carrying momentum into his second NFL season. He began the season as an emergency offensive lineman but is well on his way to being the starting right guard for the foreseeable future. Green Bay has yet to bring back veteran guard Jahri Evans who started 14 games last season. There have been no reports that Brian Gutekunst and the front office have even contacted Evans. Indicating they are either comfortable moving on with McCray or would like to see him and fifth-round pick Cole Madison duke it out for the starting job. King is a popular pick but it goes without saying that a lot is expected of the second-year corner. The fanbase was fully on board the hype train following some great plays against Julio Jones in week 2 last season. Standing at 6-3 with extremely long arms, King has a bright future ahead. His new mentor and Packer great, Tramon Williams, is impressed with what he sees from the young corner. Smilingly, Williams admitted King frequently followed him around practice constantly picking his brain. King will more than likely be one of Green Bay’s starting corners in 2018 and could be drawing the opponent’s toughest matchup. Brice has a chance to be a starting safety if Josh Jones moves into the box permanently. That is where Jones saw most of his success as a rookie and appears more comfortable. Brice was starting to see more reps on defense before injuring his ankle and requiring surgery. Like Jones, Brice is a great tackler and might be the Packers’ hardest hitter. His recovery this offseason has remained on schedule as he’s learned Mike Pettine’s system. “I love the system. Whatever they ask of me, I’m going to try to get that done. It’s no problem,” Brice said at the end of OTAs. There could be more, but these are the guys I expect to break out in 2018. They all will see significant playing time at relatively thin positions and I predict they make the most of it. Their performances may tell how far the Packers go next season. 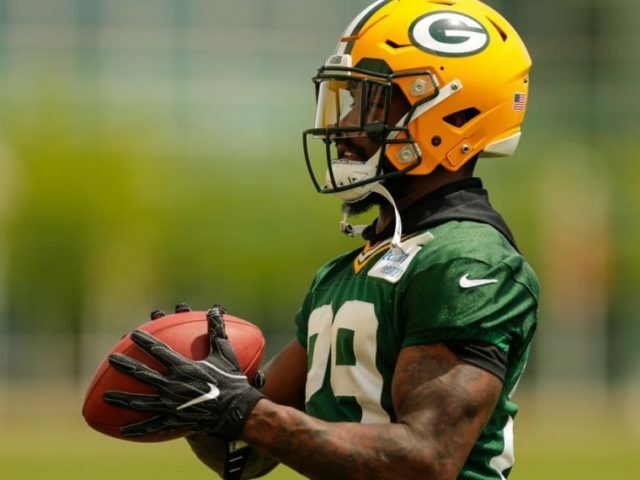 This entry was posted in Brandon Carwile, Packers 2018-2019 Season, Packers News and tagged Justin McCray, Kentrell Brice, Kevin King, Packers Breakout Candidates, Packers OTAs. Bookmark the permalink. yes.. i also have high hopes for Brice especially.. also, very curious how last years’ draftees like King, Montravius Adams and Vince Biegel do this year.